Some aspects of planning a wedding bring nothing but stress. Figuring out where to seat your strange cousin or deciding upon a final guest list. But other things are nothing but fun, and perhaps one of the most joyous things involved in planning a wedding is dressing up your cute little flower girl. 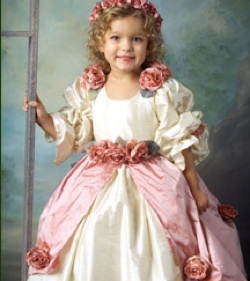 And summer is the perfect flower girl season, because there are so many light, adorable dress styles to make your little one the quintessential picture of innocence. Here are just a handful of dresses to consider for the petal-scattering girl in your wedding party. 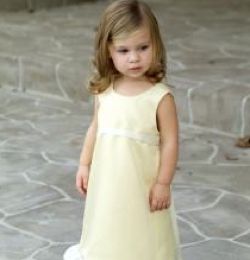 Ivory with Rose Trim: This yellow-hinted ivory dress is the perfect dress for the summer flower girl. The lightweight netting covering the skirt will allow your flower girl to feel like a princess on her big trip down the aisle and provides a very enchanted look. Plus the rose accents are both cute and tasteful. Lemonade Dress: This sweet dress is an excellent choice for both formal and casual weddings. 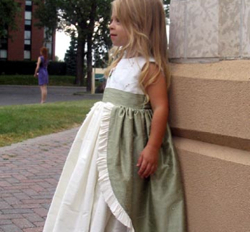 Its simple design is tasteful enough to blend at even the most elaborate wedding, but would also look great on a barefoot flower girl in a backyard ceremony. The lemony shade could not be more appropriate for summer and the ribbon accent and cute ruffle around the skirt make this dress even more precious. 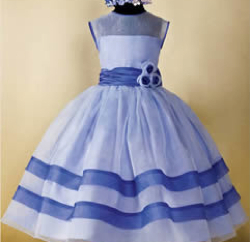 Blue Princess Dress : Blue is a great color for a summer wedding and one way to integrate your wedding colors more thoroughly is to outfit your flower girl head to toe in your chosen tone. Check out this cute and vibrant dress that’s made from a sky-blue tulle and accented by darker blue stripes and dark blue sash further accented with flowers. This is a fun dress that is very light and summery. 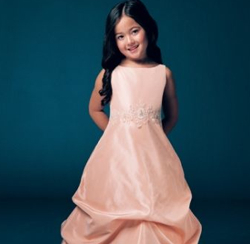 Bubblegum Dress: Wanting some color accents in your flower girl’s dress that are a little more subtle? 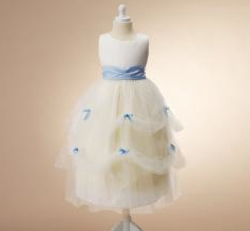 Then check out the Bubblegum Dress, a sweet, well-designed dress that features blue grosgrain bows placed daintily around the perimeter of the tulle skirt. This sleeveless number is a little more on the fancy side and calls forth a very Cinderella-like look. Cotton Bella Dress : This easy white dress is a classic style and is a perfect choice for an English garden wedding. The bright white is a great color for a summertime wedding, and also lends an extra air of innocence and purity to your ceremony. This full-length style is conservative and very pretty with crocheted lace striping and satin ribbon sown into the skirt and flowing from the collar and sleeves. Flowers by Xavi Sea Foam Dress : A gorgeous dress that, if available in adult sizes, would be suitable for the bride herself! This tulle dress is very romantic, beautiful and unique. The full-bodied tulle is light and airy for the season and the rose flower accents trailing down the skirt are simply gorgeous. Dresses by this designer all tend to be ornate and fanciful, but the shade and sleeveless style of this particular dress is more suitable for summer. 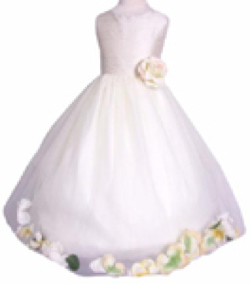 Pegeen Couture Dress: Pegeen has been making popular and stylish flower girl dresses since 1982 and they have several customizable styles that are perfect for the summer flower girl. One of the latest styles is the couture dress, and while it comes in many different colors, this color combo is both hip and great for the season. 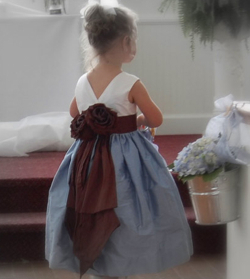 The full baby blue skirt is complimented nicely by a dark maroon rose bow that trails down the back. 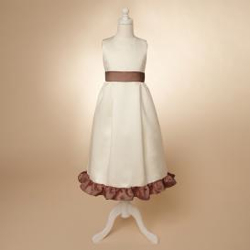 Cupcakes Dress: Understated and stylish, this is a wonderful option for a minimalist bride’s flower girl. The sleeveless white sheath is accented by a chocolate brown satin ribbon and a matching brown ruffle around the bottom. And the empire waist will give your girl more of a contemporary look. Keylime Print : Smithereman and Barnwell are a high-end flower girl dress designer that have quite a few styles worth mentioning. 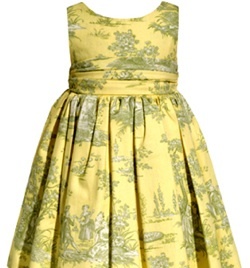 The first is this adorable printed yellow dress that features a French renaissance print. Printed fabrics aren’t common for flower girl or bridesmaids dresses, but why they aren’t is a mystery. Add a little pizzazz to your wedding style with a fun, vibrant fabric! Plaid Skirt Dress: Another dress by Smitherman and Barnwell, this great option is subtle, but so very unique. Like many common summer styles, the dress features a sleeveless white top. But the real attraction is the skirt. A delicate grayish-green and white plaid satiny fabric is gathered at the hip by a tasteful bunch of flowers. Your flower girl will be summoning the spirit of Carrie Bradshaw in this dress in no time. Blue Floral Print: Last one from Smitherman and Barnwell before we move on, but we couldn’t help but mention this great dress. Give your flower girl a little arm coverage with this simple, short-sleeve style. The traditional collar and pleated skirt give the dress a classic look that won’t ever fall out of trend. But the dress’s real saving grace is the terrific electric blue floral print material, which really pops. Your flower girl will be noticed from aisles and aisles away. Elizabeth by Mon Cheri : So, it’s true that five year old girls aren’t normally known for their elegance, but why not let your little one play grown up for a day? This lovely pink satin dress has a very high-end look for a pretty low price. The elegant gathered skirt is the dress’s centerpiece, and, again, mimics a style that is very popular this season among bridal gown designers. The Swarovski beaded waistband adds even more grace, but also tones down the dress’s maturity to a girl-like level. While the pink is a great choice for a summer wedding, so are the other colors in which it is available – gold, ivory, and white. 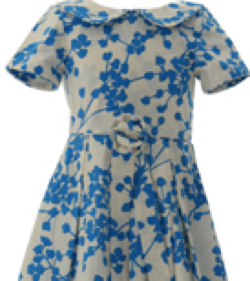 Smock Dress : This dress couldn’t be any more adorable if it tried. 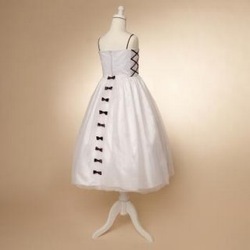 The white cottony fabric is made special by adding the eyelet top and sweet satiny apron in the back. The skirt and apron are gathered around the waist to create a rippled, pleated effect. 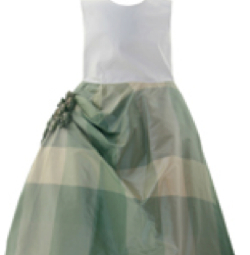 This dress exemplifies innocence and country charm and is a great option for an outdoor ceremony. 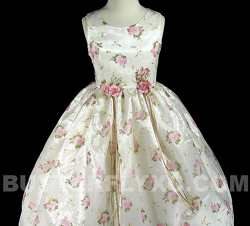 Frances Johnston Pink and White Dress: It doesn’t get any more classic flower girl than this dress, frankly. The style and accents used in this example are about as traditional as they come, which means this flower girl will fit in at any wedding. 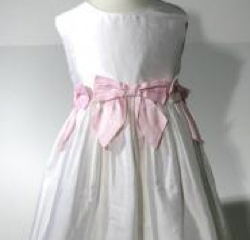 The white and light pink are perfect colors for summer, and the well-placed bows around the waist add a feminine and innocent quality. 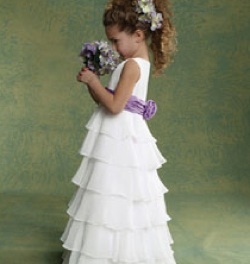 The fact that it’s made of 100 percent silk also means that your flower girl will stay cool and comfy. 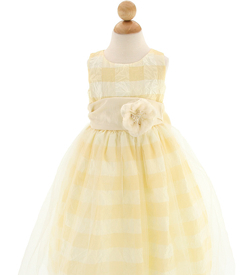 Lemon Ice Crinkle Dress: This dreamy dress is simply amazing. The yellow and white checkered taffeta covered in a layer of floaty tulle give the dress a light and airy quality accented by a bold, floral sash. The full skirt adds formality while the traditional pattern tones it down a notch. And at a price of $60, this dress really can’t be beat. Rose Petal Ruffle: A simple dress with the most understated and classic features. The sleeveless, full-skirted white dress provides the basics for the timeless style, but the designers have taken it one excellent step further by adding a sprinkling of multi-colored rose petals around the trim of the skirt that give the dress a playful and pretty look. The light pink flower at the sash also highlights the demureness of the style. Flowery Dress : Dress your little petal dropper up like a rose garden in these dresses by My Angelic Kids. 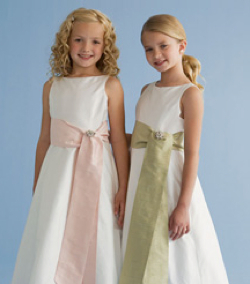 With a lightweight fabric and rose-patterned fabric these dresses will have your flower girl looking sweet, carefree and comfy cool as she walks down the aisle. The fabric has a nice sheen that will be well highlighted by the sunlight if you are planning an outdoor wedding. And the price will have you rubbing your eyes – at only $20 this dress is the must-have for budget brides. Ice Cream Flower Girl : Cute, cute, cute. This white dress with black lace-up accents is a great option for the bride who is going for a neutral color scheme and a minimalist look. It comes in a tea length or floor length style and is accented down the back by tiny black bows, black lace-up stitching on the side and black straps. The double layer of tulle gives the dress an especially full look. Us Angels Lace: Like lace? Then you’ll love these sleeveless styles from Us Angels. The lace-covered satin A-line sheath is beautiful, timeless, and innocent. Pick a floral accent for the sash that matches the color scheme of your wedding! Long Sash Dress: This classic A-line dress is accented well with a long, bold sash that is folded stylishly over at the waist and features a crystal brooch. If you’re looking for something simple, understated and tasteful, this dress may be the one for you. If you are having a garden themed wedding, then these cherry-orange blossom cakes are perfect for you! The pails that they are baked in are simply adorable. Leave it to Tartelette to come up with a lovely and scrumptious recipe! In a large bowl, whisk the eggs, sugar, oil, milk and orange blossom water. Sift the flour, baking powder and salt. Add to the wet ingredients. 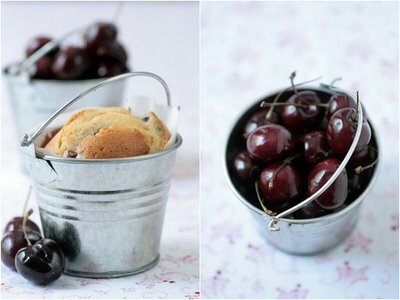 Fold in the cherries. Bake at 350 F, for 20-25 minutes. Et Voila! Once you get the basic down, you can modify this cake to what is in season. It is one of my go-to formulas when I am urged to bake something in somebody else’s kitchen. Easy, delicious and comforting. I am telling you…success lies half in the smells coming out of your kitchen and half in how fast these little guys disappear. Get the Look! ~ 4th of July from E.l.f. 2. To create a lasting shine free photo finish look, apply the Mineral Booster all over the face with the Total Face Brush. 3. Moving to the cheeks, take the Blusher in Bronzed, and gather some powder on your Blush Brush, tap off any excess then apply to the cheekbones. 4. Next use the Shimmering Facial Whip in LilacPetal as a shimmery base to the eye. Now line the entire eye with large lines using the Brightening Eye Liner in Black, getting nearest to lash line as possible. Smudge in color by using the Smudge Brush. 5. Follow by applying to the eye the Eye Shadow color in Drama, use the applicator tip to smudge in the charcoal color like an eye liner. Use the white shade right up to the brow bone to create depth. 6. Now apply the Earth& Water Mascara in Black to the lashes with several coats to create a full lash. 7. Lastly, create the soft lips by applying the New Moisture Care Lip Color in Pink Lemonade. Bridal Party Tees would like to take the time and thank everyone who visited us at the Phoenix Bridal Show. If you have not created your free bride shirt, please do it soon. Time is quickly running out and your coupon will expire on July 8, 2008. So hurry and get your free shirt before it is too late! Get your free shirt here! When you are looking for red carpet inspiration, you have to turn no further than Heidi Klume. Her red carpet styles are timeless and always perfect! After shampooing with Nexxus Diametress and conditioning with Sublime Volume, spray Nexxus Root Exxtend Root Lifter at roots only. Blow dry with a round brush, lifting the hair and aiming the nozzle at the roots to build support into your style. Set hair with Velcro rollers for maximum fullness. Finish with Nexxus 360º Volume Bodifying Finishing Mist to give fine hair lasting hold and support. Let’s Drink to Table Numbers! 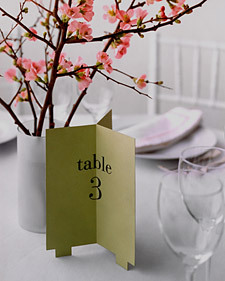 Finding table numbers that are not going to fly away at an outside wedding can be a challenge. That is why I created these wine bottle labels. These wine bottle labels serve double duty at a wedding. They tell the guests where to be seated as well as treating them to a nice glass of wine. 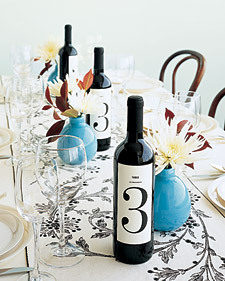 The best thing about these table numbers is that even if the guests drink the whole bottle, they are not going to fly away! 1. Soak your bottles in a full sink of warm water, or you could use a tub to do many at a time. Soak for about an hour, then peel off original label. Scrub off remaining glue. 2. Choose from one of the Bridal Party Tees Wine Label design templates. You can edit the table number text in Microsoft word to make as many as you need. To recolor in Microsoft Word: Click on the design to activate it then click on the format tab and then the recolor drop down menu. You can pick custom colors to recolor the background or the design and then you can change the live text to match. 3. Print out your chosen wine label template on 8.5×11, white full label sheets. You can buy these at any office supply store. 4. Cut along the dotted line. 5. Peel off back and place on the bottle in the desired location. Like a beacon, this table number declares its location in all directions. To make it, use a computer to print numbers onto pieces of colored cover stock (or have numbers calligraphed). Trim the papers to 6 by 7 1/2 inches. For the feet, cut 1/2-inch squares from both corners on bottom edge. Measure over 1 inch for each foot, and mark. Cut out a 3-by-1/2-inch strip between marks. Crease each sheet down the middle, and join the 3 pieces with rubber cement.